You’ve heard of green thumbs? Well, San Diego, Calif. artist Evan Lentz has created a line of jewelry that will give you a green finger. Or several of them. 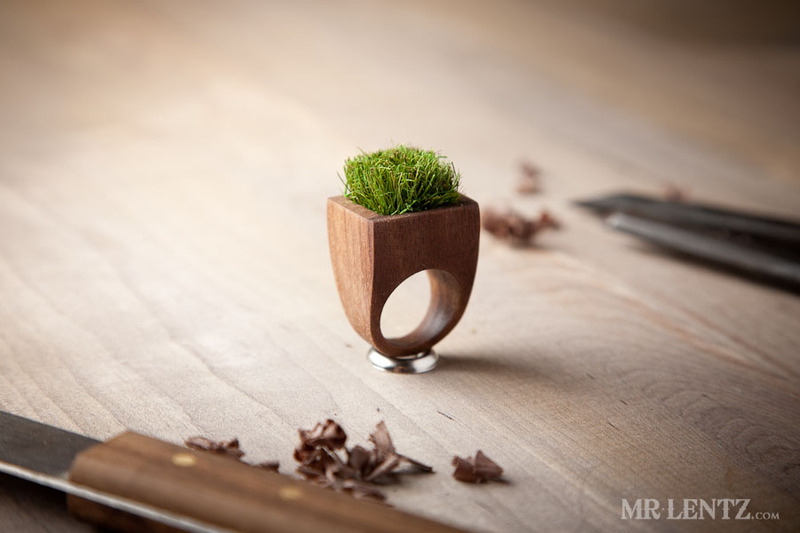 His handmade “grass rings” are made from walnut and tufts of dried grass and moss. Evan said when get got started making jewelry and art he was inspired by MAKE Editor-in-Chief Mark Frauenfelder’s book Made By Hand. His idea for the wood and grass jewelry came from a trip to the redwood groves of Northern California. I took a week off of normal life and decided to take long hikes every day through some of the most incredible scenery I have ever seen. The size of the redwoods – the abundant plant life growing out of every nook and cranny, truly inspiring. When I returned from this trip I really wanted to make something that carried the essence of that forest. Something that everyone could enjoy and build it in a way that was environmentally conscious and non-toxic. I am choosing to make things with sustainable, earth-friendly, and natural materials. I have created hand-made dyes with a walnut husk base and I use extra virgin olive oils to give the wood a subtle shine. The grass and moss he uses are not planted, but fastened to the jewelry—no mowing or watering required. Have a look.